Phillyrea is a shrub we came across a fair few years ago, in our search for clippable topiary shrubs. It seems to have been out of favour a long time – this piece about the plant by Mary Keen is from 2004, encouraging gardeners to try it out. But those 13 years pale in comparison to the last time it was popular – in the 17th and 18th centuries! Why Is Phillyrea Unpopular Now? 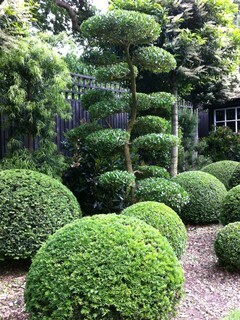 Looks amazing clipped into topiary! The fact it isn’t used more may have something to do with cost and availability. Most places who say they stock it will not have any available, while prices seem to vary greatly – a pre-clipped, cloud-pruned shrub will cost a lot more as you are paying for the topiarists time making it into that shape, while a normal 2 litre pot will be in the £8-10 range. We heard from a nurseryman it is incredibly difficult to propagate, which is backed up by the Mary Keen piece on this lovely shrub. Nope! Shears will do just fine on this tree! Especially good shears…. Like a large head of broccoli. “Tough as old boots. It’ll grow in sun or shade and on any soil but to get the best out of these trees they need space and light. You could say, the more exposed, the better. It’s only peccadillo is a terrible weakness for white fly. They’re inconvenient but there’s little you can do so ignore them. We often sell these when restoring Tudor, Elizabethan or Mediaeval gardens. There’s masses of evidence to show that Phillyrea was used extensively hundreds of years ago. The diarist John Evelyn writes of them frequently – as if they were then as common as box, yew and holly. What happened? They used to be so widespread and now they’re rare. Fantastic piece from a lovely nursery. Phillyrea – Good For Bees? If you can get Phillyrea cheap enough as a hedging plant, would this be worth a go? This really is a useful plant – easy to grow, easy to keep in shape if you have a small garden, allows you to have fun with pruning tools when you give it the topiary treatment, reflects light from its leaves to brighten up the garden and can be a boon for bees. We have planted it for one client, but will be making sure Phillyrea is down on the list of any plant schedule in the future!